This is the first post on my favorite hobby of Barbie collecting. When most people think of Barbie, the blonde, blue-eyed doll comes to mind. Don't be surprised to know that Barbie comes in many ehtnicities. Now I do believe that the folks at Mattel could do a better of of promoting the other versions of Barbie but that is another story for another time. Perhaps this blog can help spread the word. This is one of my favorite Barbies. 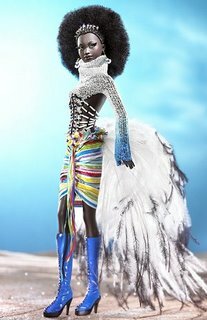 She's called Mbili and is the third doll in the Treasures of Africa Collection designed by Byron Lars. She's even prettier in person.